The Dozop Collapsible Dolly makes moves both big and small much easier. It’s lightweight (under five pounds) and easy to assemble (takes around a minute) without needing any tools to put it together. The dolly can handle up to 250 pounds of what you need to move and inline skate wheels boost maneuverability over carpet and uneven surfaces. Parts are stored inside the self-contained design to compactly stow away between jobs. Dimensions: Collapsed: 19.75" x 5.75" x 3"; Assembled: 19.75" x 19" x 5"
This has been a fantastic addition to our household (my husbands new best buddy! ), comes in so very handy! I bought it for my daughter who is a professional organizer. Many times she has to move boxes without help. This was a great help for her. The Dozop Collapsible Dolly fits perfectly in the space between hiring professional movers and trying to haul heavy stuff—think boxes or furniture—yourself. It assembles in around a minute without any tools needed and it can handle up to 250 pounds of whatever you need to move, which is especially impressive given that this dolly weighs in at under five pounds. All the parts store inside the self-contained design, like the rubber inline skate wheels that make moving over carpet or across uneven surfaces easier. When unassembled, Dozop can easily fit on a shelf, in the trunk, or in a closet. This makes this moving solution particularly convenient if you don’t have the space for (or often need) an old school, full-sized dolly. 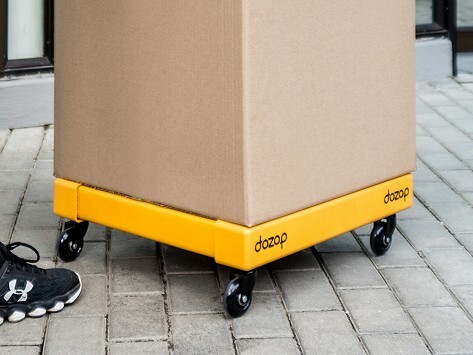 Maker Luca Buttazzoni created Dozop to be an easy alternative for one person moves or jobs like getting oversized boxes into your house or out to the car. His well designed dolly is an on-hand solution that’s ready to help whenever you might need it.